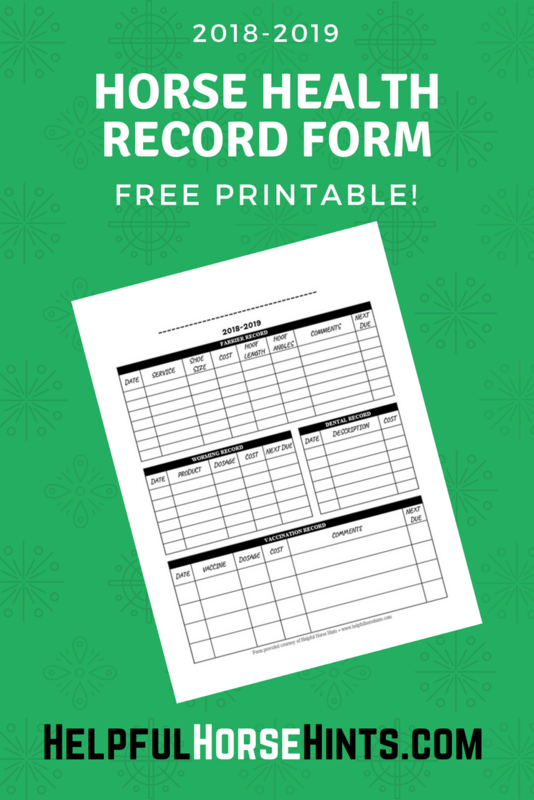 We hope these horse health record forms are just what you need to start getting your barn organized! Keeping track of a horses individual health records can be a daunting task when you have more than one horse in your care. I’ve managed up to 25 animals at a time and found it necessary to maintain a file for each of our horses. A horse health record form was always contained within that file. It is a sort of Health Record Summary. This is where we record all routine health care items such as farrier records, deworm, dental and vaccination records. Any emergency or special treatment records were maintained separately within the horses file when needed. This is the form I used for several years for all of our horses. It presents a complete summary all on one page and can easily be copied and given to a horse’s new family in the event a horse is sold. By maintaining adequate health records, you will be able to track important aspects of your horse’s health care. We have included spaces for farrier records, dental records, worming records and vaccination history. There are even spaces for notes if necessary. 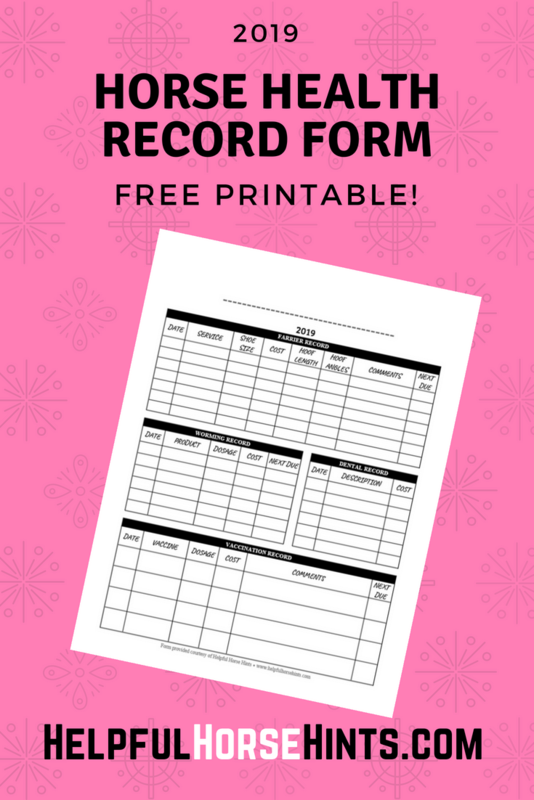 Whether you keep one horse or several, this worksheet is easy to print and will help you keep all of your horse’s dates organized in one place! This post contains affiliate links. Please read my disclaimer for more information about affiliate links. Colored Paper – Depending on how creative you want to get..you can use a pink/red paper for all medical forms, maybe blue for general history, yellow for pedigree etc. That would allow you to quickly find what you were looking for! Having vaccinated over a hundred of my own horses personally, I know how important it is to keep good vaccine records on each horse. Not only do you need to know when the vaccine was last given, it is also helpful to know if a horse has any reactions to particular brands or types of vaccines. When I give my own vaccines, I will always try to secure the sticker from the vial on the record. If I am unable to peel the sticker of cleanly, I will write down the serial number and expiration date. While this may seem like overkill, you never know when your horse might have a reaction. Having this information on hand can help track down an issue should one occur. 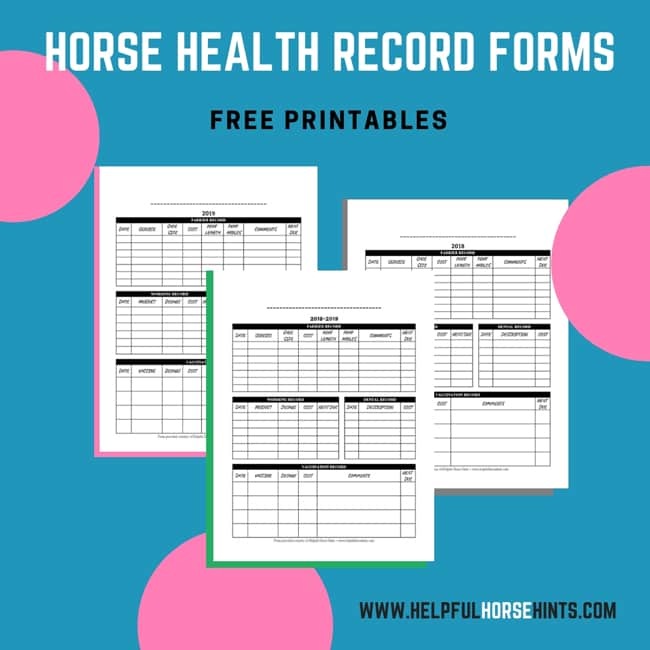 This FREE horse health record printable form includes spaces for farrier, worming, dental and vaccine records. When I designed this horse form, I hoped that you would be able to track 1 years worth of important records on a single sheet of paper. 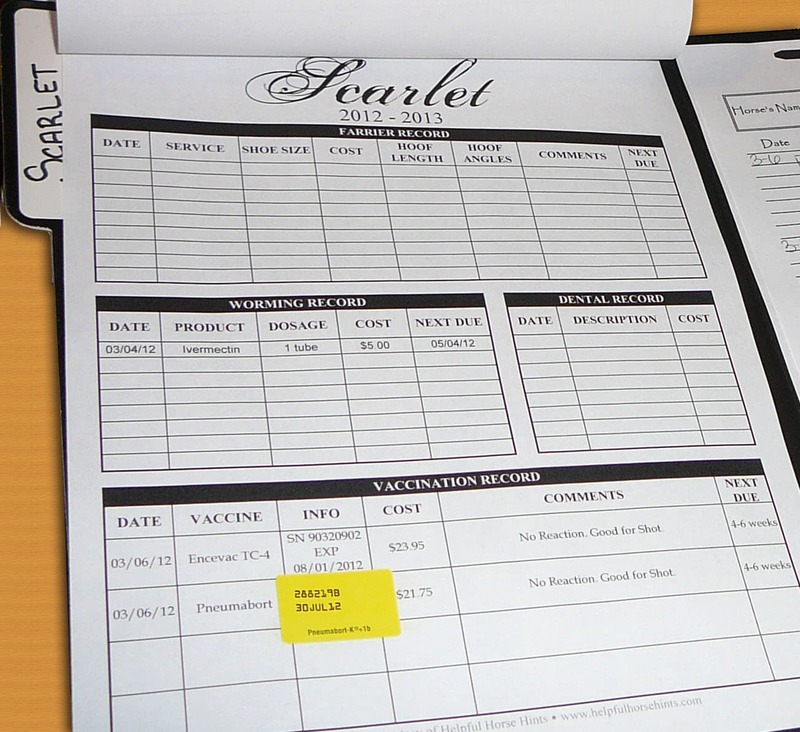 These forms can be used with a horse record folder or a stable management binder. Both methods are great ways to manage the records for your stable. Would you save a PDF version without the date area filled in. I love this form but have to cross out the dates. Thank you.